My late and much missed Father-in-law, Tom, took me to Southall in west London a few years ago and introduced me to the delights of Masala Dosa, a very simple dish consisting of a rice-based pancake stuffed with spiced potato and served with sambar (a lightly spiced sauce) and sometimes a coconut chutney. I loved it and, until recently, it was something you couldn’t find in Dublin. Tom was Anglo-Indian and was born and grew up in Chennai, the place they used to call Madras, in South India. He was an excellent cook and, try as I do, I have never been able to quite match the flavoursome dishes he prepared. His parathas were legendary and both my children would use their rather strong powers of persuasion to get him to make a huge batch on his visits to us, which he would do with remarkable good grace. 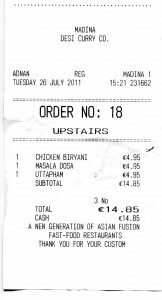 The reason I mention this is that one of the few places that serves Masala Dosa in Dublin now is Madina on Mary Street. Madina is properly called Madina Desi Curry Co. Desi, in this context, as far as I can find out, means old fashioned real native food, as you would find it in India. The two boys and I had a late lunch there today and, I have to say, it’s a bit of a find. It’s an unassuming place with tables on the ground floor and first floor. Downstairs was full and we were shown upstairs and provided with menus and water in a stoppered bottle. The menu is varied and interesting with more vegetarian dishes than meat-based ones. Starters and snacks start at about €3.50 and most main courses seem to be priced somewhere between €4.95 and €8.95. Special offers are advertised in the front window and on a menu supplement. Indian music played gently in the background as we made our choices. 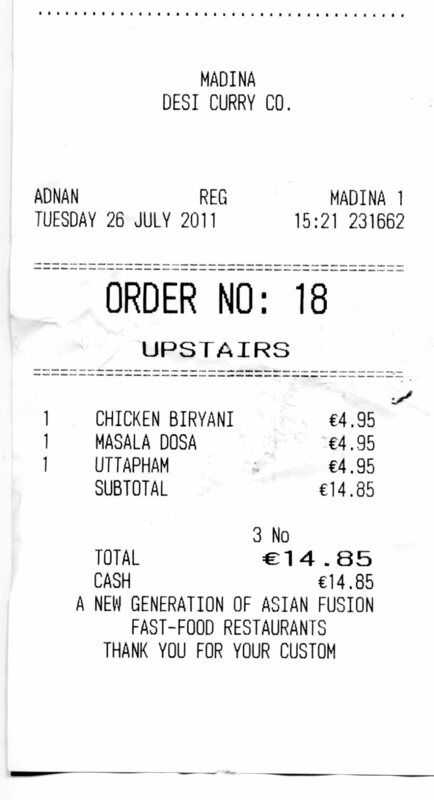 We each chose a dish costing €4.95: Son #1 went for Chicken Biryani, Son #2 for Masala Dosa and I chose Uttapham. The food arrives when it’s ready with the Masala Dosa making an appearance first. 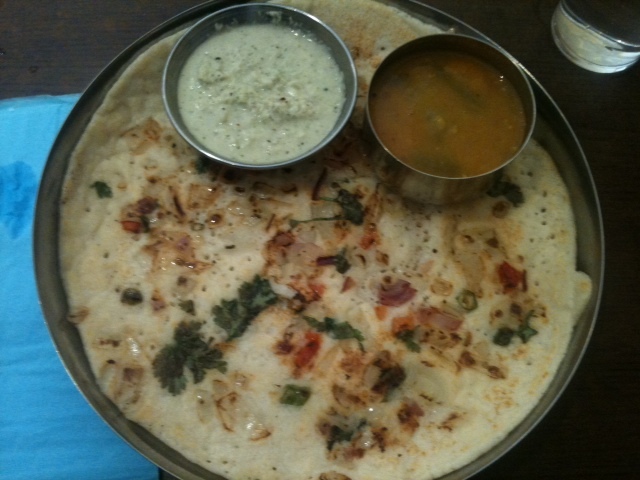 An impressive sight, the pancake was huge, with a generous potato stuffing and small dishes of sambar and coconut chutney. 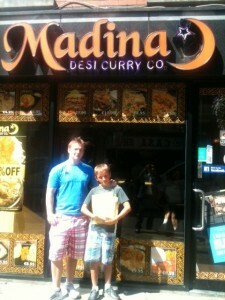 The young lad was delighted, saying that it was one of the best vegetarian meals he’s ever had. My Uttapham arrived next. Uttapham (or more usually Uttapam) is a thick pancake made from ground rice (partially fermented) and lentils. A small amount of onion, tomato or finely chopped vegetables is mixed into the batter before cooking. 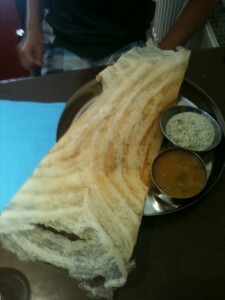 Like the Masala Dosa, it is served with a small dish of sambar and some coconut chutney. It looked appetising, tasted great, was very filling and I very much enjoyed it. Last to arrive was the big lad’s Chicken Biryani. 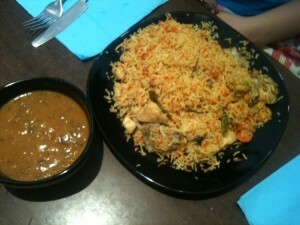 This was a big plate of Biryani, served with a delicious sauce on the side, tasting of fresh spices and coriander. 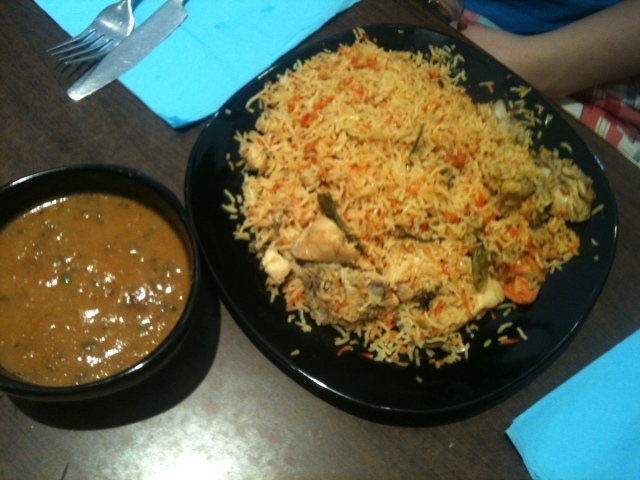 The Biryani was generously laden with chicken pieces (on the bone) with pretty well every part of the chicken used. As I’ve mentioned in a previous post, it takes a fair amount of food to fill the big lad, but he was satisfied with this feast. Until relatively recently, most Indian restaurants in Dublin were stuffed with wood carvings, brass fittings, incense and expensive menus containing the usual vindaloos, tikkas and tandooris. Thankfully things are changing. Of course there is a place for reasonably good Indian food, adapted for western tastes and expectations, and served graciously in comfortable surroundings. But there is also a place for what I think is probably a more authentic south Asian eating experience, where the food is freshly prepared with a minimum of fuss, is served when it’s ready, and doesn’t cost the earth. Madina fits this bill nicely. Speaking of bills. Here it is. Filling, tasty, satisfying food for three at €14.85. Awesome. The bill ... for 3! Hard to believe that food of that calibre can be had for such a price in Dublin….I’m salivating! Great piece! Well done. Miriam, you’re always salivating! I am so happy I found your site. I really found you by mistake, while I was browsing on Google for something else. Anyways I am here now and would just like to say thank you for a great post and an all round inspiring blog. (I also love the theme/design), I don’t have time to read through it all at the moment, but I have added your website to my favorites, so when I have time I will be back to read more. Please do keep up the awesome job!